Curiosity drove me to this recipe from Babbo pastry chef Gina DePalma. 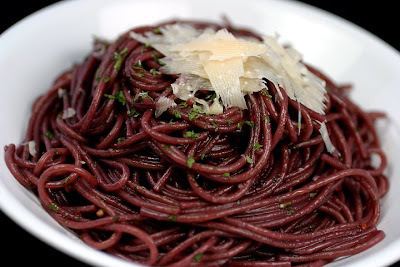 It was on the top of http://www.seriouseats.com/ for several days before I caved and cooked up this purple hued pasta. There were some very excited reactions about this dish, maybe due to the splurge of two bottles of wine needed just to boil the pasta! Whatever it is, this dish is quite simple, but elegant too. 1. Add the water and red wine to a 6-quart stock pot and place it over medium-high heat. Season the liquid generously with kosher salt and cover the pot to bring it to a boil. 2. In the meantime, peel the garlic and slice it. Place the butter and olive oil in a sauté pan large enough to fit the pasta and place it over low heat to slowly melt the butter. 3. When the water and wine come to a boil, add your spaghetti; stirring as needed to engulf the pasta in the liquid. As the spaghetti cooks, stir it often to prevent it from sticking. 4. Add the garlic to the pan and wait for it to come to a sizzle. Add the optional peperoncino for some heat, if you like and stir the garlic, keeping the heat low to prevent it from scorching. 5. When the garlic is toasted pale and sizzling, add the additional ½ cup of red wine and a generous splash of the pasta cooking water to the pan and turn up the heat until the liquid simmers. 6. Test the spaghetti for doneness; when it is al dente, transfer it to the sauté pan along with the parsley. Keep cooking the spaghetti in the juices, tossing and shaking the pan until the liquid is absorbed. 7. Serve immediately on warm plates. The pasta is delicious without grated cheese, but you can grate a bit of Pecorino Romano or Parmigiano-Reggiano over the top if you like. Notes: Next time I'll throw in some grilled vegetables. Recipe belongs to Babbo pastry chef Gina DePalma. Picture and write-up by Laura Flowers. The pasta looks beautiful and I'm sure it was delicious, but with all that wine it should be! I wanted to make this as soon as I saw it on seriouseats too, haven't done it yet though, it sounds and looks great! Laura - I LOVE Your blog. 2 of my favorite things in the world!!! I work with your Dad at Empire. Could you please e-mail me at ellingmel@yahoo.com? I'd like to pass your blog on to a group of Idaho / Spokane bloggers, but want to share with you first to make sure you have no objections. Again - Great Site and I look forward to following along. I've included it in my Top 25 recipe posts on Twitter because its such a winner!! I saw this recipe on foodgawker and had it bookmarked for a while... I had an opened bottle of wine and decided to take the plunge. It was FAB!! Hello! I just made this, and wow what a nice dish! The flavor is light, but the longer you savor the taste the more the wine flavor shines through. We're saving the rest in the fridge to make some kind of pasta salad with it (with mozzarella, basil, tomatoes). Katherine I'm so glad you like this one! Crazy how much wine it takes though. I should make it again too.